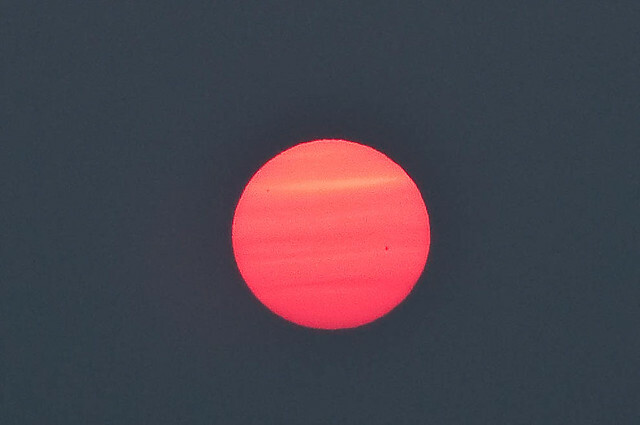 The sky was so hazy last night, I was able to photograph sunspots. Julie noticed how orange the sky was, so she said we should go to Sunset Hill Park. As the sun sank, she could see a sunspot through her binoculars. I saw the second one after processing in Lightroom. One is about 11 o'clock, near the left rim, in the bright band. The other is a little below the equator, about 1/3 of the way in from the right rim. Eek! Do not look at the sun through binoculars, no matter how dim it may seem. I have a small but noticable hole in my retinas from doing that when I was 12. Pointing cameras at it, OK, worst you can do is burn out the CCD... too bad you didn't get a prominence, still nice picture. 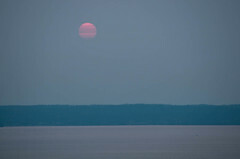 That super-red sun is often the precursor to a green flash. Did you watch it all the way down? Uh, whoops. We didn't know that. We watched it until it disappeared into the haze and behind the Olympics. I think it has to be at the horizon to see the green flash. Also, see my reply to kate_schaefer, below. That is an awesome picture, but as Rich says, don't do that. Ow ow ow. The originally posted picture was taken a few minutes earlier.